September 2015’s Arcade Block is here, as always in its awesome retro NES style box. The advertised theme for this month was The Legend of Zelda, and it’s the one of the most thoroughly integrated theme I’ve seen yet for a mystery box. 4 of the 6 included items were Zelda related. 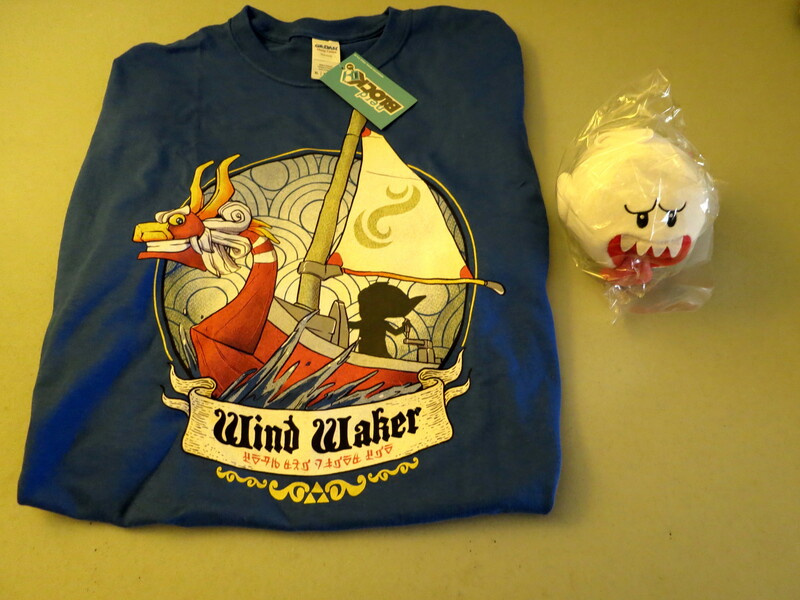 The “Product of the Month” this time around is the monthly t-shirt, sporting a good looking Wind Waker design. Next is a Springz Chicken (nice pun) accessory, a silly little amusement that’s has an extra layer of meaning if you know the connection. One of my favorites this month is a canvas print called The Hero’s Triumph. It’s a great piece of art that’s distinctly Zelda, but subtly so and non-gamers will appreciate it even without knowing the context. The last Zelda item is a nice keychain of Link’s shield. 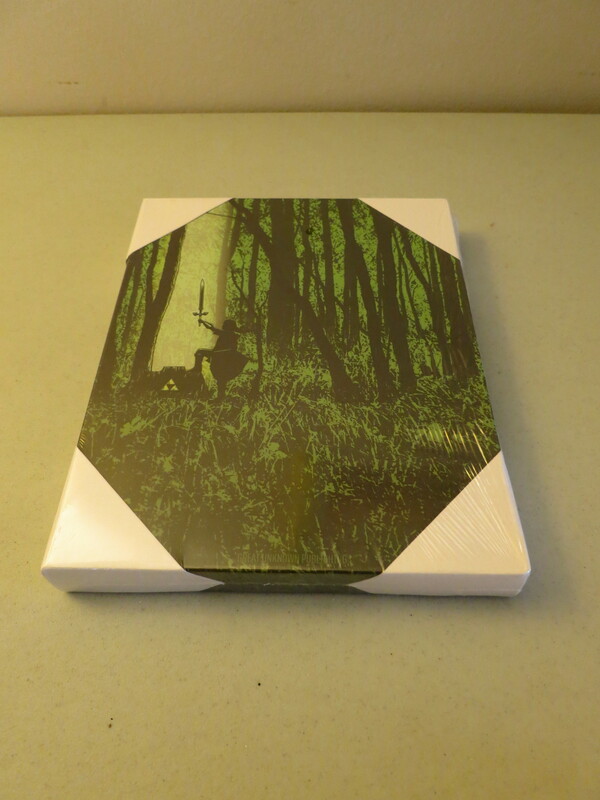 The music item this month is a little different – a 7″ record(?!) 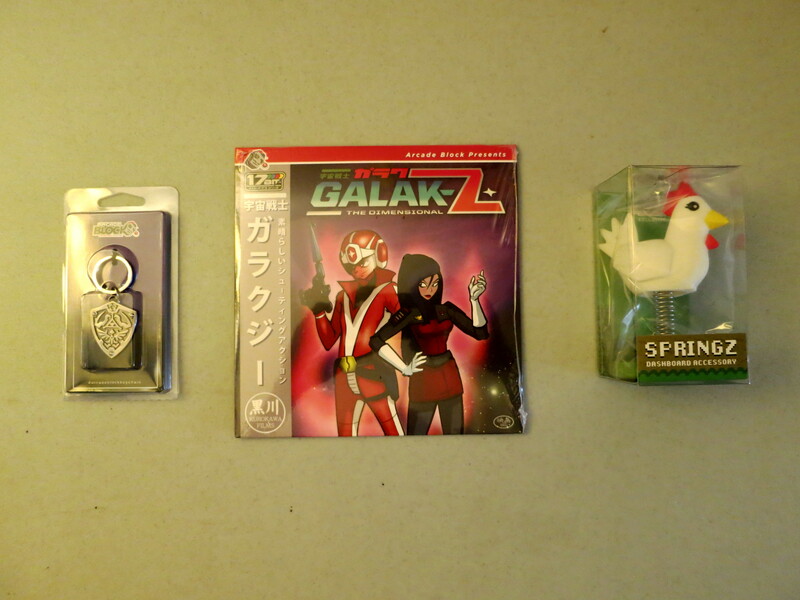 featuring two tracks from Galak-Z. Not familiar with the game or its music, but this is a neat, unusual type of thing to include. Finally each box comes with a 5″ Boo or Goomba plush from the Super Mario games. Timeless characters make this a fantastic addition. I got Boo, which was my slight preference. I love the variety of items even when keeping to a theme, and despite not being a huge Zelda fan those items were all appreciated. 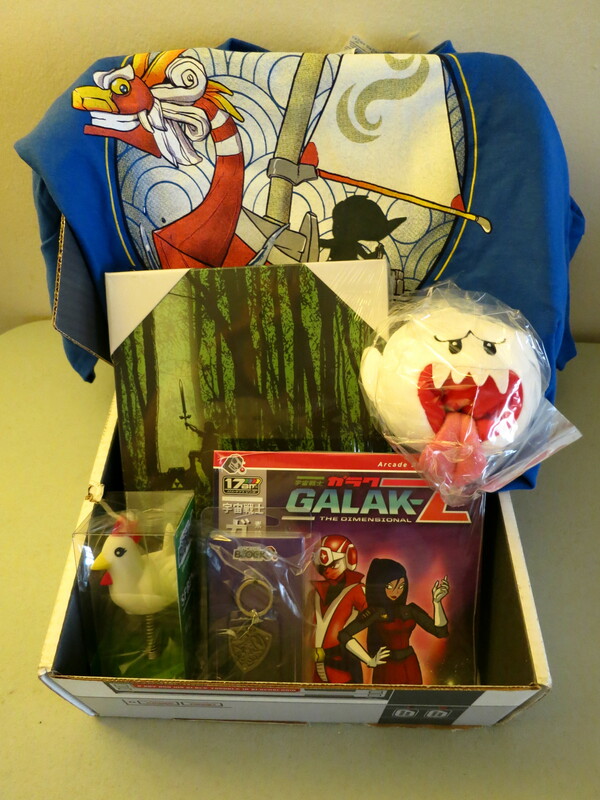 Throw in a classic plush and a unique collectible and the result is pretty much the best box I’ve gotten yet. Arcade Block continues to be my favorite and most recommended of the mystery box craze. 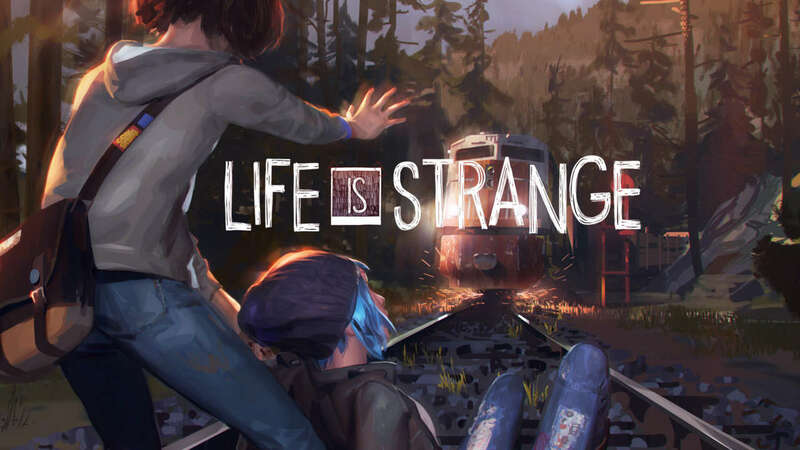 Episode 1 of Life is Strange established a compelling mix of mysteries, characters, and atmosphere that I enjoyed quite a bit. For the most part episode 2 capitalizes and expands on the potential shown. One of the best parts is that the major decisions made in episode 1 carry over and influence a good bit of dialogue and some pieces of major developments. So far this is the best integration of this type of carryover I’ve seen. There’s a big, tough choice at the end that looks to have similar ripple effects going forward. The time mechanic is interesting and continues to be well implemented and integrated. Hints and foreshadowing are everywhere, but it’s hard to see where it’s all going. I love that kind of story. The biggest weakness of this episode is in the middle where in an attempt to break up the tension a little there is a fetch quest that slows things down way too much and is frustrating to finish. It’s an unfortunate misstep that derails most of the momentum that had been built up. Things recover nicely though, with three harrowing scenes later one and the big choice I talked about earlier to finish. There’s still a strong feeling of “no right answer” to most of the choices, which is a great accomplishment. Overall a good follow up and I’m still extremely invested in Life is Strange and eager to continue with the next episode. I’ve followed Shimmer since its beginning, and in anticipation of 10th Anniversary weekend I wanted to take a look back at ten great matches over the course of Shimmer’s existence. I don’t want to split hairs trying to rank things, nor do I have the time to pour over every match like that. Everyone has their favorites. For me this means that a true top 10 list from me would likely be dominated by singles matches between pairs of Kana, Madison Eagles, Sara Del Rey, and Cheerleader Melissa. While deserved, this would not make for the most interesting retrospective. So I’m just going to say now that all such pairings were fantastic matches and should be watched. Not to worry, these four will definitely still have plenty of appearances in this list. I want to feature a variety of match types. So this series will instead be a look at ten hand picked matches that I enjoyed and feel gives a good representation of both the quality and variety Shimmer has to offer. All would be in let’s say my top 50. Out of over 600 matches, this is still a pretty respectable group. 😉 My apologies if I overlook other peoples’ favorites. First up are matches that featured several wrestlers competing against each other for victory. Part 2 will feature tag team matches, and part 3 will finish up with singles matches. Multi-woman matches allow several wrestlers to be featured while also providing unique opportunities for storytelling. My favorites took good advantage of both aspects. Shimmer’s first multi-woman match was a great way to top off the follow up to their initial show. The main event of volume 2 took the four wrestlers in the top matches of volume 1 and pitted them all against each other in an elimination match that would identify the top prospect in Shimmer at the time. This was a natural way to build off volume 1 and allowed four of their top talents to go all out while advancing ongoing issues between them. The format was used perfectly to tease and add tension to current feuds. By having the eliminations occur by “off pairs” rivalries were continued without anything being settled while allowing wrestlers to benefit from defeating top competition. For example, with Haze eliminating Martinez the outstanding question left of who was better after volume 1’s draw between Martinez and Del Rey was left unanswered. Sara came out looking like a million bucks with a big win here end everyone benefitted from the emphasis on competition and wins and losses. After an inconclusive number 1 contendership match on volume 27 MsChif finds herself defending against two hard hitting challengers. MsChif had been champion for a year and a half after her unexpected dethroning of initial champion Sara Del Rey and on quite the roll, but Lufisto had a strong showing against her on volume 26 and Kong had never been pinned in Shimmer. The triple threat portion was the hard hitting conflict expected from these three and did a phenomenal job of establishing how tough all three competitors were and how big a task MsChif was left with once Lufisto was eliminated. The remainder of the match was David vs Goliath in all the best ways, with both women confounding her opponent by kicking out of usual finishers. MsChif hit an incredible high angle Desecrator to do the impossible and keep her title in an excellent match with a pretty much perfect story. Here we have a very different Del Rey from the early days of Shimmer. She’s a dominant heel now who (as we are reminded in a video package) has recent hard fought victories over both her opponents here and wants to regain “her” Shimmer title. Hamada is another tough veteran trying to work her way into her first title shot, and McKay is an up and comer trying to prove she can compete with the best. Jessie’s also looking for a title shot for personal reasons – the current champion was her former partner Madison Eagles. I loved the choice of participants in this match and how they were all coming from different directions and backgrounds. It made sense for each to be there but the similar yet contrasting motivations added a whole other layer to the story. The difference in characters lead to different approaches in the match. Del Rey was all business, trying to maintain composure and steamroll her opponents. 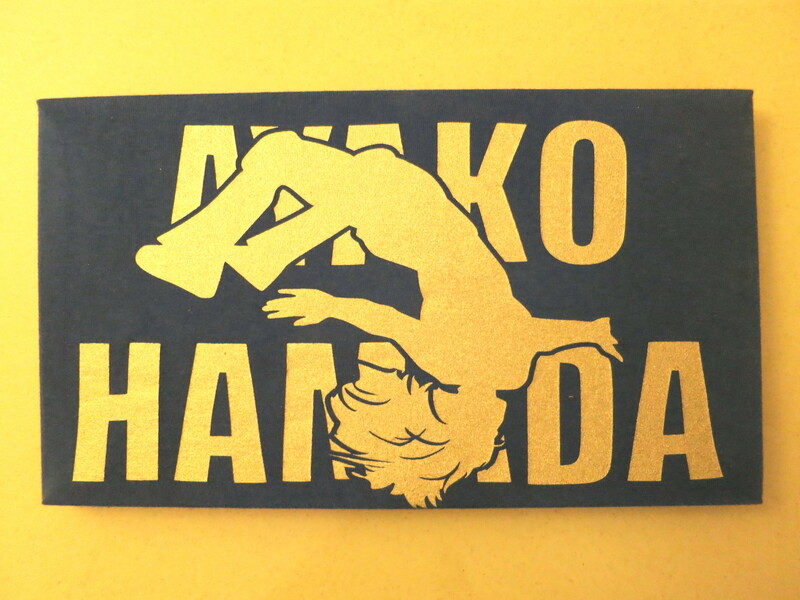 Hamada was “goofing around” a bit, trying to get into the head of Del Rey (including a great bit during introductions running around the ring with thumbs down to encourage fans to boo Del Rey, doing a super-fast count herself when Del Rey goes outside, etc). McKay was waiting for her opportunities to strike and trying to make the most of them, knowing she was a bit outmatched. Not everything was perfect but the action was excellent regardless and with all roles played just right this match came together into one of my favorite forgotten classics. Del Rey’s giant swing, Hamada’s dueling tree of woe dropkicks and McKay’s tornado DDT on Hamada out of an electric chair drop position on Del Rey were a few of the highlights. Prazak and Perez were great on commentary reenforcing all the issues and implications here. Even in a three-way the very seldom pin on Del Rey gave McKay instant credibility and set up another fantastic match when she challenged Eagles. This is another (similar) example of three wrestlers with different approaches and motivations coming together into a fantastic match. Eagles was on a win streak after coming back to Shimmer from a break due to injury following dropping the Shimmer title, Kana’s the one playing mind games here and Shida’s the up and comer trying to make her mark. It’s interestingly not likely the original plan for this volume, and was most probably supposed to be a singles match between Eagles and Shida. The main event should have been a tag match with Lufisto and Kana vs Martinez and Melissa, but Melissa was out from an injury suffered at volume 60’s taping earlier in the day so that became a singles match and Kana ended up being added here. Of course part of the fun here is the perfect amount of comedy worked in before they got down to full out wrestling. Madison takes exception to Shida and brandishes her trademark fork early. Kana steps between them and gestures that she’s thought ahead and takes out a spoon to the crowd’s delight. Shida shoots them both a look of sheer disbelief (“Did you both forget I carry a weapon?”) and walks to the corner to get her kendo stick. Madison’s not happy with the shift in firepower and trades her fork for a broom. Shida easily knocks that away. She swings at Madison with the kendo stick and misses, but Kana then taps Madison in the head with the spoon and poses happily. Shida now charges at Madison with the kendo stick and Madison counters with a double leg takedown, but she takes another spoon shot and more gloating from Kana. Prazak marvels on commentary on how spoon has somehow won the battle of fork vs spoon vs kendo stick. This is one of my favorite sequences in Shimmer history, It was amusing, played around with established elements, and didn’t overstay its welcome. The match itself was fantastic with constant shifting alliances (Kana really enjoys turning on her temporary partners in matches like these) and some really nice sequences. The triple wrestler spots and holds were unique (love Shida’s missile dropkick on Eagles into a splash on Kana) and they made the best of having three phenomenal strikers in there. Kana’s toughness was reenforced by Madison needing to load the kickpad to take Kana out of the equation, and Shida lost nothing in defeat given her showing. Kana kicks at the kendo stick after the match and makes faces at Shida. Shida gets a well deserved “please come back” chant. Everything clicked and I loved this. Hope everyone enjoyed this little trip down memory lane. Parts 2 and 3 to come. This trade collects Saga issues #25-30. Saga is a tightly plotted, layered adventure featuring a rotating cast of regular characters and it would be confusing to start here. Go back to the beginning. While still good and extremely intriguing,Vaughan and Staple’s graphic, explicit, disturbing epic seemed to lose a little momentum here for me. 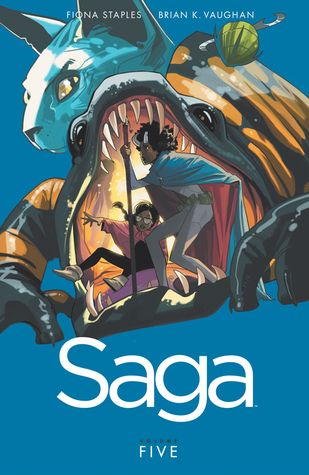 All three of the major plot threads and groupings of characters were decent but lacked some of the nebulous quality that has made Saga special. The quest to save The Will pushes really the grossness and explicitness of the comic, and unlike usual it feels like it’s there for its own sake instead of a natural part of the adventure. The last page of volume 4 left me beyond anxious for the latest installment, but to be honest I don’t think that potential was fully capitalized on. There could have been so much more to the teaming of fathers than CONSTANT bickering and threats. Alana’s thread progressed strongest, but even there it’s really the impending resolution that’s most interesting, and the rest felt like biding time. Part of the issue here is as Vaughan tries to make his leads more complex he’s actually making all of his most likable characters less so. It’s a fine line to walk. Flawed characters are compelling characters, but the reader has to continue to want to see them rise above, not get annoyed by them or start to look down on them. Exacerbating the problem is the separation of key pairs of characters. It serves the story, but also robs it of some appeal. And while I like the “no one is safe” feeling, killing off recently introduced supporting cast looses impact fast. Established characters need to feel in jeopardy too if Vaughn wants that edge to the comic. All that said, the conclusion of some ongoing plot lines towards the end of the trade are well done and set up the next one nicely. There’s good progression and some important developments here, even if it isn’t quite up to what’s come before. Max is a shy 18 year old photography enthusiast returning to her home town after 5 years away. She has a lot of normal high school concerns, like schoolwork, dealing with bullies, making friends, missing classmates, murder, and suddenly being able to turn back time. Life is Strange is an adventure game with great atmosphere. It has a strong opening that draws the player right in, cranks up the mystery, then settles down a bit to let things unfold. The story is intriguing and Max makes a compelling point of view character. The dialogue can be a little stilted, but it gets the point across and for the most part the characters do sound like high schoolers. The environment is fantastic. It captures the feel of the locales perfectly, including a boarding school, associated dorms, a run down house, etc. I found myself stopping to look at all the posters and flyers as much out of curiosity as to find clues. There’s a significant amount of little things to poke around. Some players will find it on the short side, but it had good progression and found a decent stopping point, and is after all just episode 1. 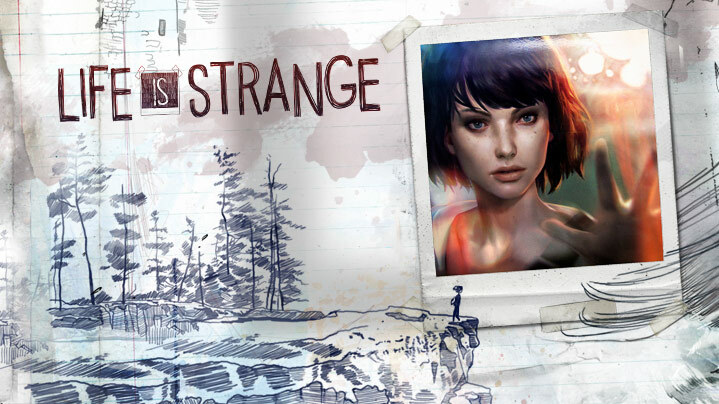 I thought Life is Strange was great and will definitely be checking out further chapters. I loved the premise of Gotham Academy straight away. The concept of normal(-ish) children attending a spooky school on the edges of Batman mythos is fantastic. Cloonan does a good job taking that potential and letting it evolve in its own way at an appropriate pace. This is a mystery style tale, more concerned with atmosphere and story than action (though there is enough of that peppered in to keep things exciting). So the pace might be slow for some and it does meander here and there, but I liked the gradual build up of the school, its students, and its secrets. And while the mysteries are all intriguing, Cloonan knows that the true draw is the characters, and keeps the focus firmly on Silverlock and her friends. The supporting cast is nicely varied and starts showing depth by the end of this volume. Some start out a bit one dimensional for immediate identification and to move the plot along, but happily none of them stay that way for long. Maps is a favorite of mine, as her relentless optimism is contagious and always stays on the side of endearing rather than annoying. Olive having no love for the Batman is interesting, as he almost plays an antagonist. I found him a bit harsh, but it’s a valid interpretation and suits the story. There’s also a fantastic cliffhanger in that regard leading into the next volume. The art is great. It has a soft feel that might take getting used to, but everything is clear, expressive, and conveys tone and emotion well. The coloring is amazing. Always vivid, and while usually appropriately dark it brightens up whenever needed. Overall everything really comes together as a whole here, with the art nicely complimenting an imaginative story. It’s strong ties to Gotham mythos could be double edged, as there were name drops and other references of significance that could be lost on readers not already familiar with Batman comics. But personally I enjoyed Gotham Academy and will definitely be continuing with volume 2. 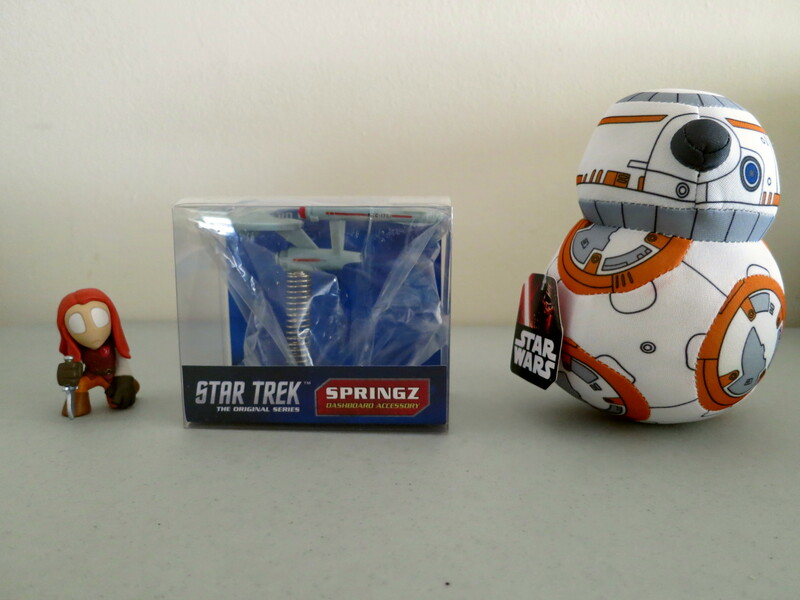 The promised Star Wars item from the upcoming movie was a BB-8 plush. Decent enough, and now I know the name of the droid I’ve seen plastered everywhere. For Star Trek a Springz U.S.S. Enterprise dashboard toy was included. Cute little novelty. There was a Funko mini mystery box for Supernatural. I have no familiarity, but the figure looks nice for what it is (the zombie eyes are a bit creepy here though). The remaining two items dive into the mash-up realm. Jurassic Galaxy was apparently an online joke that a poster artist turned into a work of art. A small sized print of the original limited run poster was included here. It’s a great little piece of imagination run wild and combines Star Wars, Terminator, Guardians of the Galaxy and of course Jurassic Park. 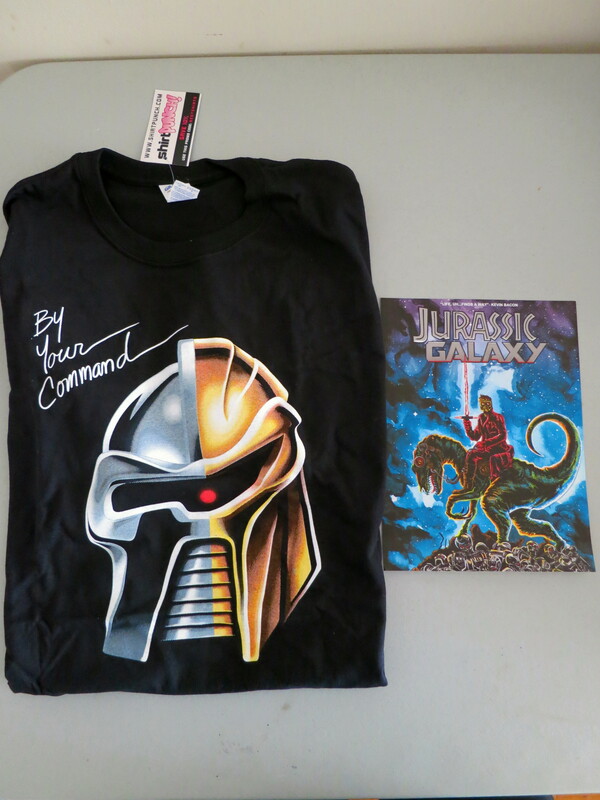 This month’s t-shirt is a different kind of mash-up, combining different elements of Cylons and Battlestar Galactica over the years. 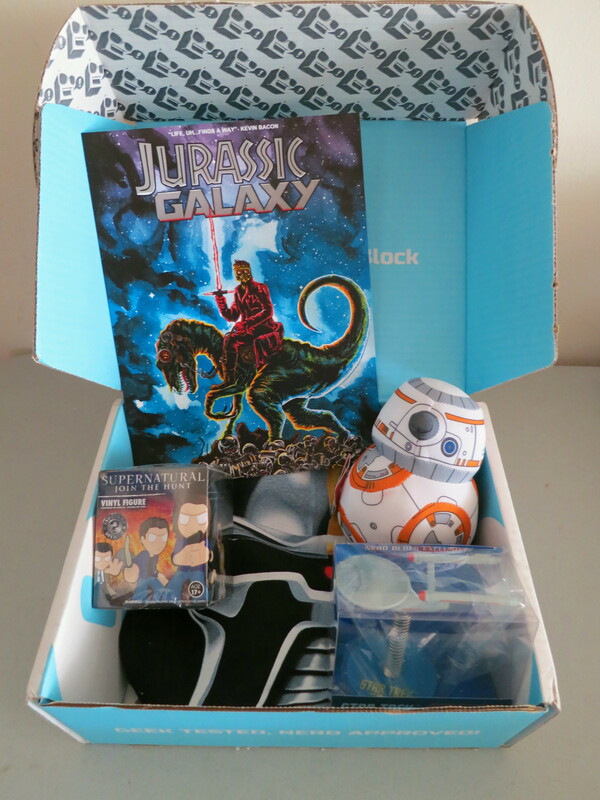 Nerd Block certainly delivered what it promised this month, and everything in it was on theme and of decent quality. I have to admit though for my personal tastes their Arcade Block offering is vastly superior so far. I have two more Nerd Blocks coming with my subscription, so we’ll see if that remains true.